Explanation: Still bathed in sunlight, the International Space Station tracked through night skies above Hombressen, Germany on May 12. 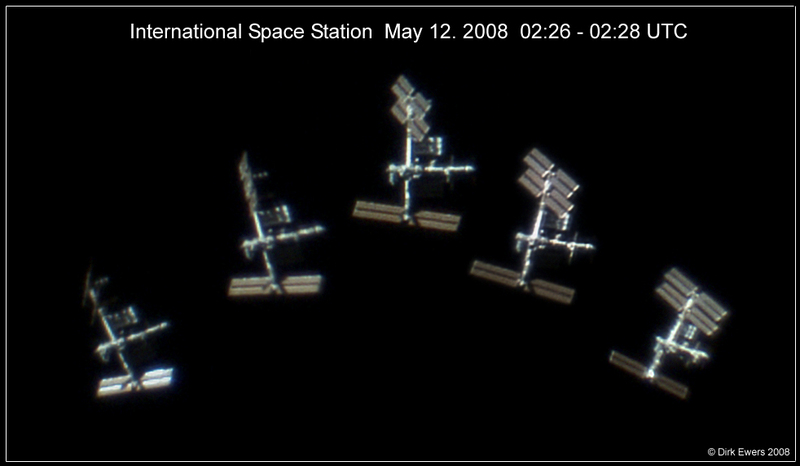 From a range of at least 360 kilometers, astronomer Dirk Ewers was able to record an impressively sharp video sequence of the passage with a small telescope, using some of the individual frames to construct this composite image. Sporting solar arrays, the station's integrated truss structure is nearly 90 meters long. The ATV Jules Verne is docked with the station, while the space station itself is orbiting at aproximately 27,800 kilometers per hour (17,200 mph). A complete video sequence is available as a 1 megabyte mpeg file or avi file.